On 5 October, Latvijas Banka issued a unique set of collector coins dedicated to the outstanding Latvian poet Eduards Veidenbaums (1867–1892). The set of two coins forms a stylised image of a pair of spectacles. The face value of each silver coin is 2.5 euro. 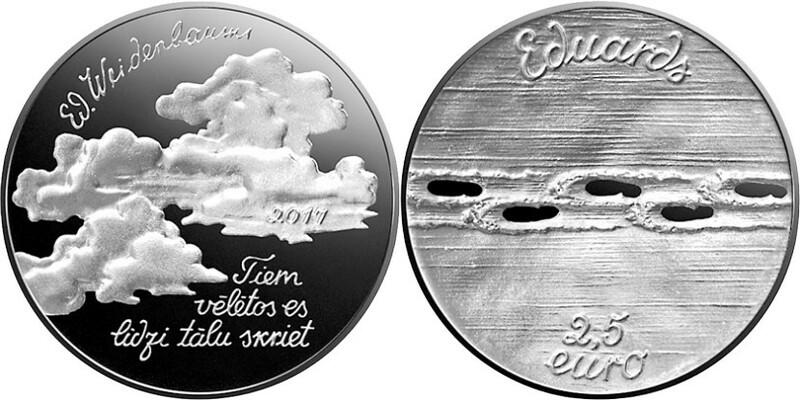 The author of the graphic design of the coin set "Eduards Veidenbaums" is Arvīds Priedīte, and the plaster models were created by Ligita Franckeviča. The coin set has been struck by Koninklijke Nederlandse Munt (the Netherlands). 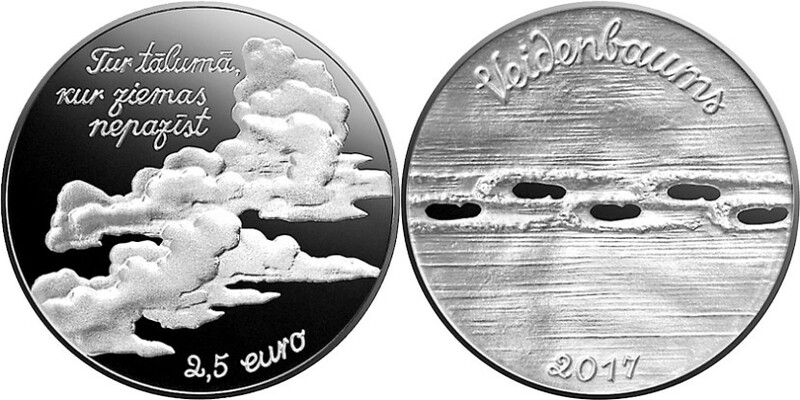 The obverse of one coin features clouds, the facsimile signature of Eduards Veidenbaums and a line of his verse "Tiem vēlētos es līdzi tālu skriet…" (I'd love to follow them far away...). The obverse of the other coin depicts clouds and a line "Tur tālumā, kur ziemas nepazīst" (Far away where winter never comes). The reverse of both coins features a horizontal trail of human footprints in the snow. According to the concept of artist Arvīds Priedīte, the set of both coins forms an image of stylised spectacles associated with Eduards Veidenbaums: we recognise him from the single authentic photo that has survived up to now. The collector coin set is dedicated to the 150th anniversary of the outstanding poet. The power of the poet's talent, unknown to a wider range of readers during his lifetime, has been recognised over the years and plays an important role in Latvian poetry. His poetry, created at the end of the 19th century, has remained surprisingly topical: people know Veidenbaums' poems by heart and quote him, composers use his lyrics for music also in the 21st century. "Awaken thee, free spirit", "The clouds pass by like white swans", "My thoughts are deep", and other lines of his verse are known not only by literary historians, they are still used in everyday communication. 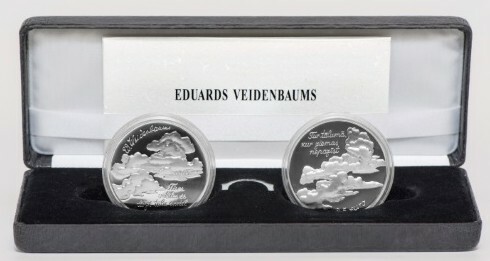 The collector coin set "Eduards Veidenbaums" is legal tender in the Republic of Latvia, yet the release of such coins in circulation is highly unlikely, as they are in fact works of art and are in special demand among coin collectors and other interested parties. The maximum mintage of the coin set is limited to 3 000.